If you have noticed a grass-green plant on your lawn with stems covered in flat leaves broader than grass blades growing in a flattened circle, you probably have more than one. Crabgrass spreads quickly and can choke a lawn if left untreated, but it also tells you what you need to do to make your lawn healthier in general. 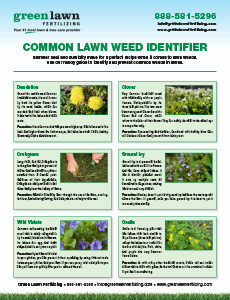 Find out what crabgrass is telling you about your lawn and how to get rid of this invasive weed below. Crabgrass thrives in warm, dry conditions. Mowing the grass too often and too short is a common cause of warmth and dryness in a lawn. Watering your lawn too lightly over the summer can also leave your grasses’ deeper roots dry while watering the shallower roots of weeds like crabgrass only. Letting grass grow long enough to shade and provide moisture to the soil, as well as watering deeply (4-6 inches of damp soil) will protect and strengthen your grass, helping it to fight off invading weeds. If your mower has a dull blade, your grass can become bruised and ragged every time you cut it. Grass that has been harmed by a dull blade grows more slowly and gives crabgrass an opportunity to grow where the regular grass otherwise would. Using a sharp mower blade cuts grass cleanly and encourages it to keep growing steadily, taking up the space that can otherwise be used by weeds. If you think your grass has been harmed by a dull blade, give it time to grow out before re-cutting. Soil compaction keeps air and water from reaching the deeper levels of soil where grass roots grow, so that only plants like weeds, which tend to grow nearer to the surface, can thrive. Your grass may be producing plenty of seeds, but compaction may be keeping them from sending roots down. Aerating the soil and reseeding your lawn with grass that grows well in the amount of light your lawn receives can help to combat the crabgrass-friendly conditions caused by soil compaction. Reseeding with a mixture of grasses is the best way to ensure that your lawn continues to grow densely during all seasons. If your soil’s pH level is too high or too low, your grass is not getting the nutrients it needs to be strong enough to crowd out weeds like crabgrass. Your soil may also need applications of lime to help balance the pH level. 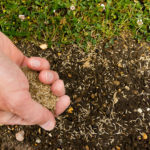 Green Lawn Fertilizing technicians provide you with a complimentary soil analysis to help determine the acidity level and whether or not your pH is too high or too low. Soil compaction can also be a factor in keeping nutrients from being circulated through the soil via earthworms and water drainage. For crabgrass control as well as the balancing of your soil pH with lime applications and proper ongoing fertilizing treatments to keep crabgrass off of your lawn for good, call your local Pennsylvanian lawn care professionals at Green Lawn today.